2 in stock. More on the way this week. The Apricorn Aegis 3.5" 8TB USB 3.0 Padlock DT Hard Drive FIPS 140-2 Level 2 is FIPS Level 2 encrypted secure portable drive with huge storage capacity of 1TB. It also uses the USB 3.0 interface for maximum transfer speeds so you can do more faster. Simple to set up, software-free and providing on-the-fly AES Hardware Encryption, the Apricorn Aegis 3.5" 8TB USB 3.0 Padlock DT Hard Drive FIPS 140-2 Level 2 delivers our widest range of storage capacities, from 1TB up to the massive 10TB, making it the perfect desktop secure storage device for large amounts of sensitive data and big files. Utilizes Military Grade FIPS PUB 197 Validated Encryption Algorithm. 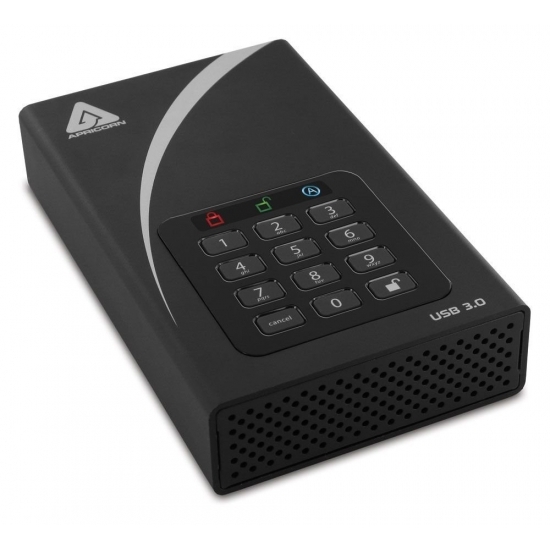 Featuring 256-bit hardware encryption, the Aegis Padlock DT seamlessly encrypts all data on the drive on the fly, keeping your data safe even if the hard drive is removed from its enclosure. With a super speed USB 3.0 interface, you can now access your files faster than ever before. 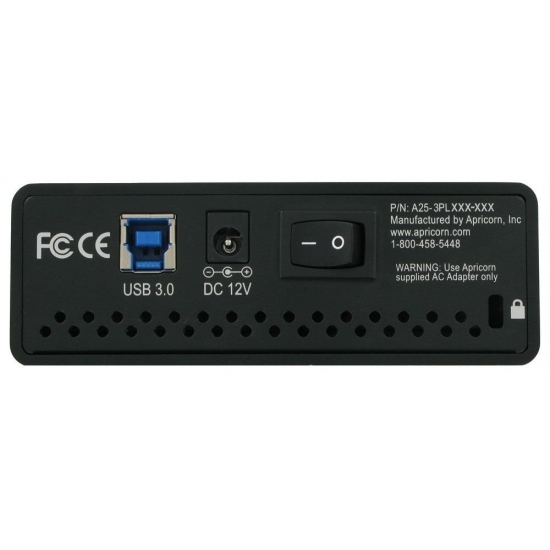 The Aegis Padlock DT is also backwards compatible with USB 2.0 and 1.1 ports. Software Free Design – With no admin rights to contend with the Aegis Padlock DT is a breeze to implement. 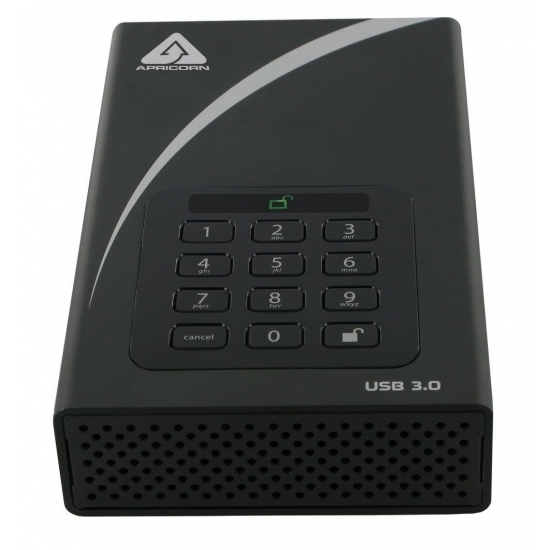 With no software installation required for setup or operation and the ability to run on any platform, the Apricorn Aegis 3.5" 8TB USB 3.0 Padlock DT Hard Drive FIPS 140-2 Level 2 provides stress free deployment in corporate environments. The Aegis Padlock DT can be configured with independent Admin and User PINs. The Administrator Feature allows enrollment of up to five unique User ID's and one Administrator. If the User forgets their PIN, the drive can be unlocked using the Admin PIN. Featuring 256-bit hardware encryption, the Apricorn Aegis 3.5" 8TB USB 3.0 Padlock DT Hard Drive FIPS 140-2 Level 2 seamlessly encrypts all data on-the-fly as it's being written to the drive, keeping it safe even if the hard drive is removed from its enclosure. The Padlock DT is shipped without a factory pre-set PIN meaning that in order for the drive to be set up and used, a unique Admin PIN must first be enrolled at the onset of the initial setup process. The Padlock is authenticated by its onboard keypad, eliminating software hacking and key-logging attack vectors. Additionally, the buttons are coated with urethane to be wear-resistant, preventing signs of most commonly used buttons. The Aegis Padlock DT has two read-only modes; the first is enabled / disabled exclusively by the Admin within the Admin mode. The second read-only mode can be enabled or disabled by anyone with an enrolled PIN for that particular drive. Ideal for forensic applications where the drive's contents must remain intact and unaltered for later examination, or for when the drive is to be accessed by several people in a public setting. 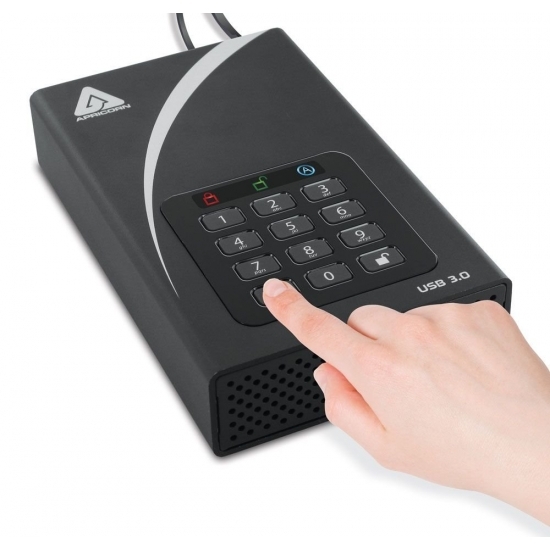 The Aegis Padlock DT automatically locks once it's unplugged from the computer's USB port, power to its USB port is interrupted, or after a pre-programmed period of inactivity. The Aegis Padlock DT also employs a useful drive reset feature, which can be implemented with a unique command. This clears all PINs and data, and creates a new randomly generated encryption key, enabling the drive to be reset and redeployed as many times as needed. After the programmed number of failed PIN entries has been attempted, the Padlock will assume it is under brute force attack and will destroy the encryption key and lock itself, rendering the data useless and requiring a total reset to redeploy the drive. High Quality Aluminum, Heat-Dissipating Enclosure. The Aegis Padlock DT robust design has a solid aluminum enclosure which is ideal for whisking away heat from the rotating drive inside.